Friendly URLs attempt to mask the fact that your content is being served up by an application by rewriting the URL that Visitors see in their URL bar. For example, a page with the URL "http://example.com/some-friendly-page" is more friendly than a page with the URL "http://example.com/index.php?cID=some-unfriendly-id". Friendly URLs are not only more likely to be indexed by a search engine, they are more likely to be remembered by a human. Friendly URLs require mod_rewrite functionality. The CMS will install and run without friendly URLs mod_rewrite, but if your server supports mod_rewrite then we recommend using it. In the download, you should find a file named .htaccess. Provided Apache is configured to read directives from .htaccess files in your web directory, you can just use it as it is. If you are running the CMS on shared hosting and the URL to your site contains a tilde (~), you will need slightly different rules. You should edit the htaccess_for_tildes_in_home_dir.txt file, replace "yourname" with your directory name, then save this file as .htaccess. 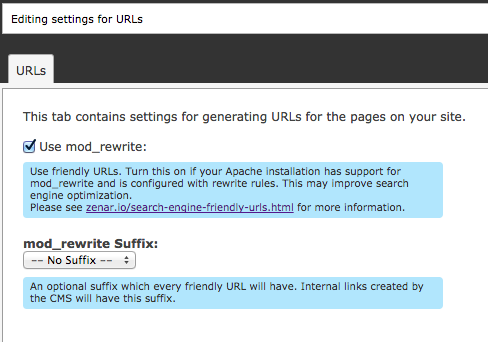 To enable the friendly URLs you will also need to enable them in the CMS by changing the mod_rewrite_enabled and mod_rewrite_suffix site settings. 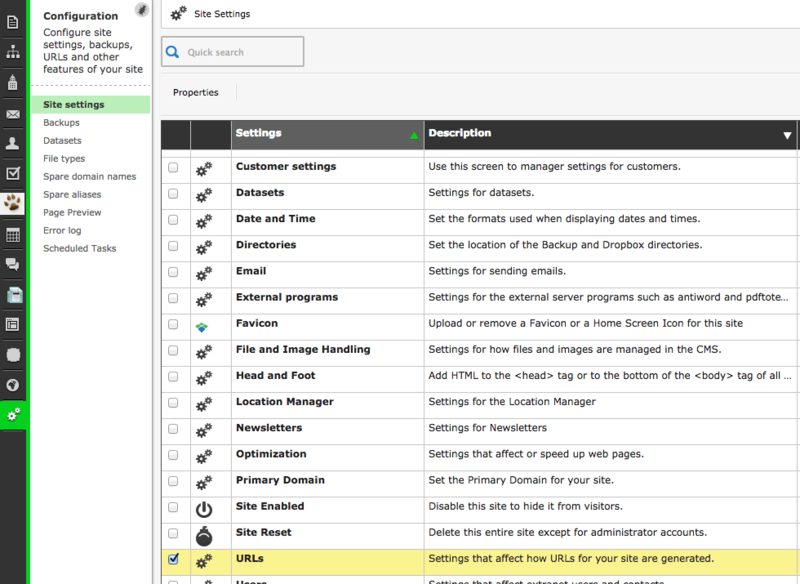 To do this go to Organizer > Configuration > Site settings > URLs and click "Properties"
An admin box will open where you can choose to use mod_rewrite as well as choose the suffix that goes onto the end of the URL (.htm or .html). Click "Save" to save the settings you have just chosen. Note that the line AllowOverride All is important. If it is set to "None", Apachewill not read your .htaccess files.